Pajamas for women over 40: style doesn’t stop at bedtime! When you consider that one-third of our life is spent sleeping it only makes sense that we should put some thought into what we wear during that time. I fall into the latter category. Pajamas should not be an afterthought, they should be an acknowledged part of your wardrobe. They should be a part of your wardrobe that you have put some thought into and include items that you make conscious decisions about. When it comes to pajamas for women there are so many choices. There are also quite a few things to consider when you’re looking for a good night’s sleep. Our style evolves over our lifetime. As we get older, we tend to be a little more on the conservative side. We opt for pajamas that offer more coverage and perhaps more practicality. The fit and style of pajamas are important. If these two elements are off, you will be uncomfortable. Discomfort will most likely cause you to wake in the middle of the night to adjust…something. The bottom line is pajamas should fit you well. There should not be any tightness or pulling, and the only thing you should feel is comfort. 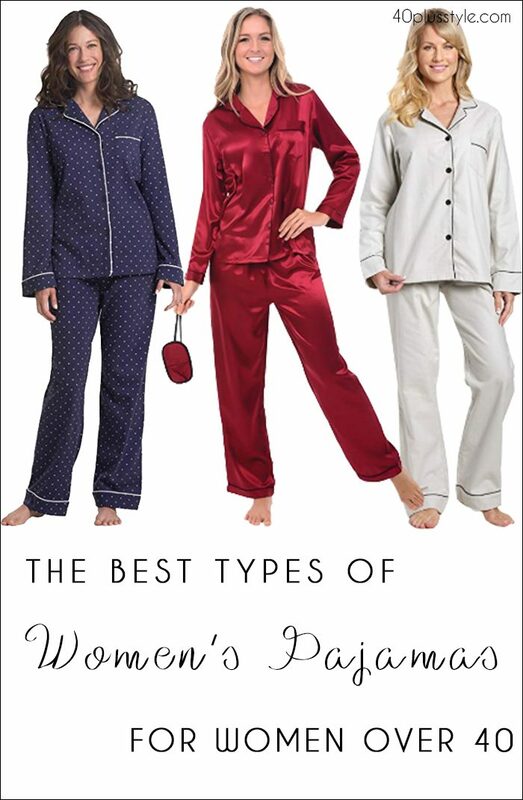 Pajamas for women are available in all size categories so it should not be difficult to find the right fit. Remember to think of your pajamas as an extension of your wardrobe, don’t be afraid to have them tailored for the right fit. Nothing detracts from an elegant look like ill fitting clothes, pajamas included. When choosing pajamas fabric is probably the most important factor. The fabric you choose directly affects your body temperature, your comfort level, and subsequently your quality of sleep. Understanding the properties and benefits of the fabrics most often used for sleepwear is important. This will help you make the best choice for your needs. Cotton fabrics are probably one of the best options for pajamas as they are soft, lightweight and easy to care for. Additionally, cotton allows for air circulation due to its breathability. It is important to note that cotton absorbs moisture, so if night sweats are a concern this may not be the best option for you. For those that want to sleep in luxury, silk is a great option, as it is a natural thermo regulator. It keeps you warm when it’s cold and keeps you cool when it’s warm. The primary concerns with silk pajamas are that they may be slippery. Although it’s often recommended to dry clean silk pajamas I personally just wash them by hand. If that’s too much work for you the the dry cleaning bills can add up. You could still save these for special occassions though! Moisture-wicking sleepwear is great for anyone who deals with night sweats. Just like activewear, these fabrics draw the moisture to the surface and allow it to evaporate, allowing the wearer to remain dry. During the cold winter months, flannel is a great option as it is breathable and provides warmth. Although I personally find polyester pajamas too hot, you can’t beat how they look. These satin pajamas look just like silk and get raving reviews. 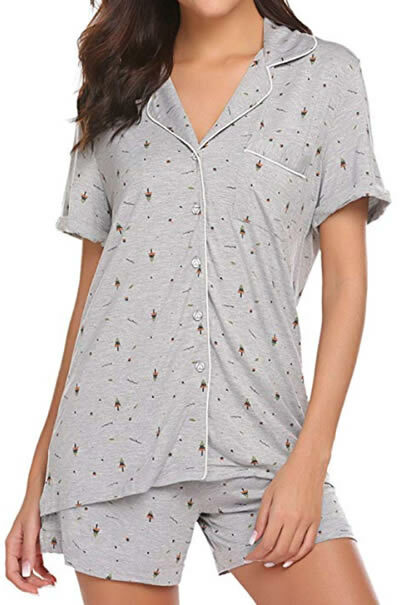 While long flannel pajamas are a great idea to stay cosy during colder months, you also need to ensure your wardrobe has sleepwear to keep you comfortable during warmer weather. Shortie pajamas or cropped pajamas are a great option for this, providing comfort and coverage while keeping you cool. What do you like to wear at night? What helps you to feel comfortable and to sleep better? 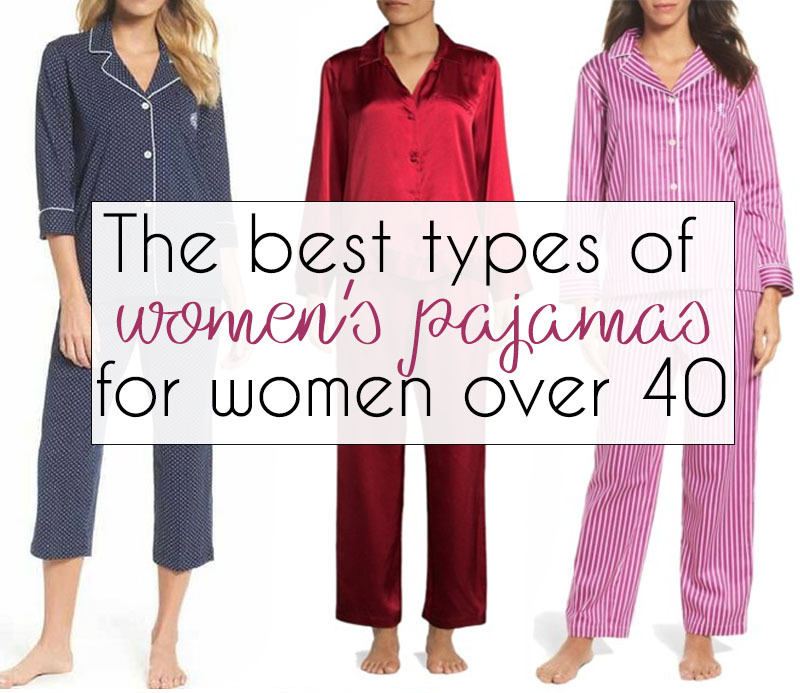 Enjoyed this article on the best pajamas for women over 40? Share it on Pinterest! This is a very timely as I am looking to replace my sleepwear due to night sweats. You mention moisture-wicking sleepwear but you failed to specify which fabrics are the best in moisture-wicking. Some guidance I this would be greatly appreciated. thanks for the feedback Nicole. These look great! I totally agree with you Sharon – pajamas should be flattering and we should feel good in them. I have an extensive collection of pj’s and robes in all fabrics and colours and yes, I love flannel for our cold Canadian winters. I recently picked up some Kate Spade cotton black and white polka dotted/striped pjs on sale and I absolutely love them and are looking to purchase another pair. Even at their regular price I would have purchased them – they even have pockets! I haven’t ever bought any PJ’s. I am more of a night dress woman. And it is very hard to find a good one. Especially for winter. I would buy the one you describe! Definitely. I wear night gowns as I don’t like tightness around my middle when I sleep. For Australian hot summer nights I’ve recently found a cotton silk mix gown that is so cool to sleep in, has pockets, can be washed, and not as expensive as 100% silk.